April 4, 2010 - Managing director of Abu Dhabi Investment Authority (ADIA), Sheikh Ahmed bin Zayed al-Nahayan body was located on Tuesday after his ultralight cashed on On March 26, 2010. Ahmed was flying in a two seat ultralight plane when he and his pilot crashed into a lake near the Sidi Mohammed bin Abdullah Dam near Rabat, the capital of Morocco. An all out rescue was launched with included search teams from Dubai, Morocco, France, Spain, UAE and the United States. The pilot had been rescued the same day and was taken to Rabat Hospital were he was reported to be in stable condition. Divers had search into deep muddy waters for five days. Divers efforts were hampered due to the water was muddy as a result of heavy rain the days before the crash and water visibility was extremely poor. Local fishermen are also taking part in the search. At the time Ahmed ultralight plane went down, it was believed that Ahmed was wearing his metal head helmet. Search helicopters were brought in and fitted with medal detectors to assist search personnel. The search helicopters flew up and down the lake in a grid like pattern. The cause of the crash continues to remain unclear and few details have emerged about the accident. Back in March 2008, the brother of Ahmed, Sheik Nasser bin Zayed al-Nahyan was also killed in a helicopter crash over the Persian Gulf. On Wednesday Ahmed was buried in his native Abu Dhabi, the family held a brief ceremony, attended by the president, Sheikh Khalifa bin Zayed al-Nahayan and other dignitaries. Ahmed's body was taken away by ambulance for burial at a nearby cemetery. 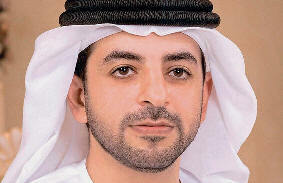 Sheikh Ahmed bin Zayed al-Nahayan was born in 1969 in Al-Ain in Abu Dhabi emirate. Ahmed graduated from United Arab Emirates University and joined ADIA in 1994, before being appointed as its managing Director three years later. Abu Dhabi Investment Authority (ADIA), is the world's largest sovereign wealth fund. ADIA is a sovereign wealth fund owned by Abu Dhabi, United Arab Emirates. ADIA has never published how much it has in assets. As a result of this, there is some debate on how much the fund has under control. Accepted estimates have been between $650 billion to approximately $875 billion in assets. On November 26, 2007, ADIA agreed to invest $7.5 billion in Citigroup, the largest United States bank. This deal gave ADIA 4.9% of the New York?based bank, making it the second largest shareholder, with Prince Alwaleed Bin Talal Al Saud of Kingdom Holding of Saudi Arabia the third largest shareholder, with 4.3%. In 2009 Ahmed was ranked as the 27th most powerful person in the world by Forbes, in although Ahmed brother, Sheikh Zayed bin Sultan Al Nahyan is the Chairman of ADIA. Ahmed's eldest brother, which practically more powerful than Ahmed, but inaccurately not listed in the list of most powerful person, but ranked 2nd in Forbes the World's Richest Royals. 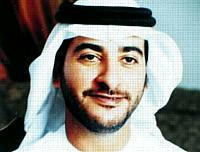 He is one of the sons of Sheikh Zayed bin Sultan Al Nahyan.